Microsoft has just announced that it has changed the storage limits for Site Collections and how they use storage from your available tenant storage. In the old model, if you reserved 100 GB for a site collection, the storage was reserved from your available tenant storage. In the new model, only the used storage counts against your allocation – if your users have only stored 10 GB of content into the site collection then that frees up the remaining 90 GB back into the pool. In addition, Microsoft has provided a new manual and automatic setting for site collection storage. Auto means that storage is allocated as needed; Manual means that you can set storage quotas for each site collection. As posted previously in my article Guidelines for Customization in SharePoint 2013, Microsoft is pushing custom code development off the SharePoint platform and providing new ways for developers to provide customizations both as SharePoint embedded “apps” (similar to what used to be called Web Parts) as well as completely external applications that use Office 365 as a backend content repository. For those still working with SharePoint 2007/2010 and even SharePoint 2013 on premise, this is a fundamental shift to the farm deployed, server side code solutions or even the sandbox deployed solutions that were the model in previous versions of SharePoint. The new Office 365 APIs provide access to SharePoint, Exchange, and Active Directory data through REST and OAUTH flows, allowing for a completely external application on any platform to leverage content stored in Office 365. The Office 365 Development Patterns and Practices site has been re-launched with new code samples and documentation on how to leverage the latest APIs. The REST SharePoint API now supports JSON Light, which allows the calling code to specify how verbose the response should be in returning data from SharePoint. There is a new solution pack available specifically for SharePoint 2013 branding and site provisioning that includes documentation, code samples, etc. Microsoft announced in May 2013 that they would be setting up a data center in Australia. However, a year later there is still no official announcement and the closest data center is in Singapore. Microsoft is now expected to announce the official unveiling of its long awaited Australia based Azure data centers at its partner conference on September 2-4. What happens to a site when it is archived (e.g. delete it, export it, lock it down, move it to another site collection, etc.)? Here are a few options and best practices to answer both questions. A really simple approach to archiving is to simply change the permissions of the site to be read only or to even lock it down further so that it is not longer even read for intranet users. Reading could be restricted to a small group of corporate site managers who can still access the site for historical purposes but for everyone else, the site is now invisible and off limits. Changing the search settings so that the site is no longer available in search results. Changing the title or look and feel so that the site shows clearly that it is in archive state. Turning off version control and workflows. With a little bit of custom scripting, one could write a workflow or script that does this automatically based on a triggering event. Alternatively, this could be done manually by the Site Administrator. One obvious choice is to move the site to a separate “archived” area within your site structure. 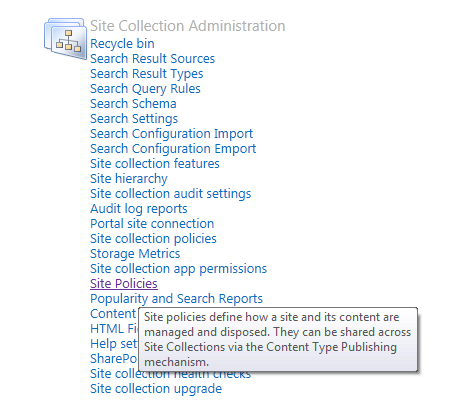 Within SharePoint, moving sites within a Site Collection can be done using the Content and Structure tool (requires Publishing feature to be enabled). If you need to move your site to another site collection entirely, this is not trivial, especially with SharePoint Online. The reason for this is that your site is dependent on features that are deployed to the site collection that may not be available in the site collection that is the target destination. In addition, there are no GUI tools available out of the box to support this move – it has to be done through an export and import process using either Central Admin (only available on premise) or PowerShell. This creates an external file that can be re-imported if it is ever needed. This approach lacks any automatic triggering mechanism to determined when a site is to be locked down. Another approach is to use a third party migration tool such as Sharegate or Metalogix to move your sites to another Site Collection or even an entirely different farm. These tools provide sophisticated archiving capabilities that are worth investing in especially for enterprises with large volumes of sites/documents. 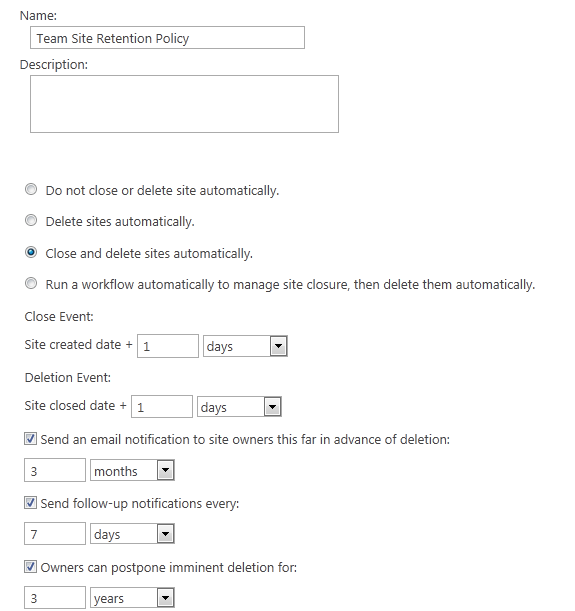 SharePoint 2013 supports a site based retention policy that can archive a site based on policy rules. Site policies are created at the site collection and apply to sites within the collection. For each site, the policy has to be applied individually under the site settings. The policy prescribes both when a site should be archived and what happens to the site as a result. However, as you can see by the settings, the policy options are reasonably limited and the triggering date is based on the site creation date and not on some other type of triggering event – for example, 90 days of inactivity. Another approach to using the Site Policy concept is to implement a custom workflow. Such a workflow can add additional business logic to the transition of state from open to closed. 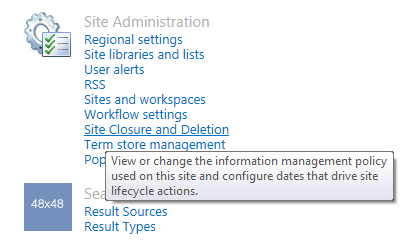 Within the Site Policy concept in SharePoint 2013, you can elect to run a workflow to manage site closure. Such a workflow could send an email to the Site Administrator to ask if they are still using the site and use the answer to determine whether to close the site or leave it open for another year. Within the policy, you can have the same workflow run on a periodic basis to determine again whether the site should be closed. Microsoft has been working on a new set of tools for Visual Studio that will allow you to define a complete cloud deployment model for custom applications that you build in Visual Studio. For example, you can create a custom ASP.NET MVC application that uses SQL Server as its back end database as a project in Visual Studio today, but the new Azure Resource Manager will allow you to also define the cloud infrastructure components that are required for your custom application using Azure Gallery templates. The current toolset allows you to create only new types of “Cloud App” – a plain ASP.NET web site and a ASP.NET web site with SQL Server. Additional templates will be added for other common scenarios. The cloud app solution essentially creates a set of script files for deploying your environment within Azure. The scripts are in a combination of JSON templates and PowerShell scripts. The scripts are fully parameterized and you can create multiple “Resource Groups” to deploy, e.g. different environments for dev, test, prod, etc. Once you have configured your resource group, you can publish your application to Azure through Visual Studio or through PowerShell. External users cannot be existing employees, contractors or onsite agents for your organization. Creating their own personal sites, edit their profile, etc. Access Power BI features including Power View, Power Pivot, etc. If you need your external users to have these features, they would need to be added as regular subscription users. In particular, if you are targeting Office 365 the key message is that you cannot deploy custom code to the SharePoint farm. You are still allowed to deploy Sandbox Solutions but they must be “no code” and are only typically used for branding and template extensions. Everything else should be a new SharePoint “App” where the code lives externally to SharePoint and uses client side frameworks to access SharePoint data. I needed to create a SharePoint 2010 demo farm for some testing purposes, so I decided to plunge into creating a brand new virtual network complete with domain controller, active directory and a new SharePoint 2010 farm. Here are some key lessons learned and some very useful articles that helped me complete the task. An Azure Virtual Network is a private network that can be used to segment your virtual data center into logical zones. Because the network is private, you can control the IP addresses, set up a traditional domain structure, add your own DNS server, etc. You can also create a VPN tunnel either as a site-to-site or point-to-site connection. I tried out creating a point-to-site connection from my laptop to the virtual network and it worked like a charm. Creating a new Virtual Network is easy and can be done using the Azure Portal. The next step is to create a new domain by setting up a Domain Controller and Active Directory server. I used this article as a guide and created myself a virtual machine that could act as a primary domain controller. When you create the new VM, use either the standard Windows Server 2012 R2 Data Center or Windows 2008 R2 SP1 templates to create your server. Check out this article for more details on setting up a static IP address. Once you have a static IP address, you can install Active Directory and set up your server as a domain controller. Once you have created a new domain controller and DNS server, you need to set up the DNS server in the Virtual Network itself. This can be done through the Azure Portal. This happened even when I configured the server itself with the appropriate DNS entry – it needs to be done at the network level in order to work properly. Once you have your working domain and virtual network, you can now add additional virtual machines to your network. When you provision the machine, make sure you use the cloud server attached to your Virtual Network. Once you have your VM up and running, add the DNS for your domain controller and join the domain. Now you have a VM running in your newly created domain! Once I had a VM properly configured, I installed SQL Server and SharePoint on the box and now have a fully functional SharePoint 2010 Farm running on Azure! Microsoft has just released a new update to Power Query with a few new enhancements to improve the loading of data into your Power Pivot models. One of the best features in the update is improved error reporting and debugging. In the older versions of Power Query, if you loaded up a million rows into your model and a few rows failed (typical scenario was type conversion errors such as someone putting “None” into a column that should be a number), it was very difficult to track down the failing rows. This has now been addressed in the latest update. Now you can see a list of every row that created an error with a specific message to explain why the row failed the load process. In addition, you can now set a default replacement value for any value that generates an error on the load for each column. For example, if I had a CSV file that had “N/A” stuffed into a numeric column, I could change this value on load to 0 instead of removing the row (or another appropriate value).